CEDAR RAPIDS, Iowa (Friday, April 13, 2018)-Kirkwood Community College dedicated the Statler Agricultural Sciences Center at Washington Hall in a ceremony yesterday on the college’s main campus. 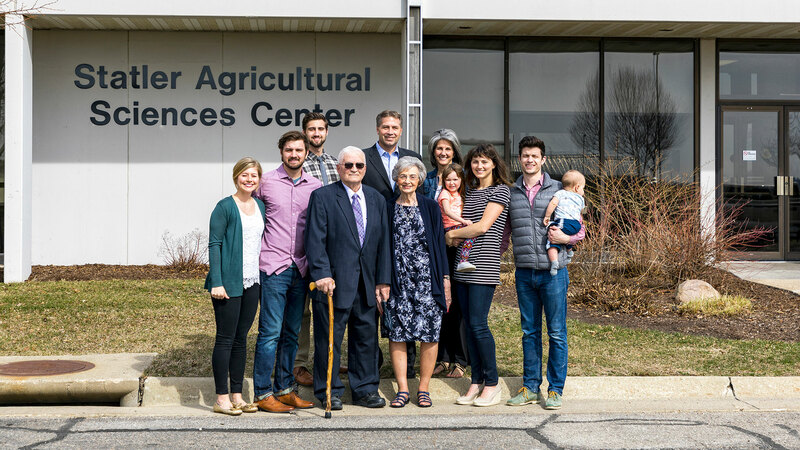 Attended by college and community leaders, the event recognized the significant contributions to Kirkwood’s Agricultural programs made by Larry and Jan Statler. Larry founded Kirkwood’s Agriculture program in 1968 and led the department until his retirement in 1990. His wife Jan served an important role as a department assistant for nine years. Together they worked to build a foundation of excellence that led to Kirkwood’s recognition today as the number one two-year agriculture department in the nation. Kirkwood President Mick Starcevich, who spoke at the event, said it was important for the college to recognize the Statler’s big impact. In honor of Larry and Jan’s service to Kirkwood, the Kent and Julie Statler family have made a $1 million gift commitment to the Kirkwood Foundation to fund student scholarships. Kent is the son of Larry and Jan and is also a member of the Kirkwood Foundation Board of Directors. According to Starcevich, the pledge is yet another example of the family’s long-held devotion to students and the college. For more information on scholarships available through the Kirkwood Foundation, go to www.kirkwood.edu/foundation.